The holiday season ended faster than you could say, “Jingle bells!” Your inner party animal mourns the relatively sharp decline in social events. Your wallet, however, breathes a sigh of relief. Your marathon month of holiday merrymaking has thinned it out significantly. Nonetheless, many more reasons to celebrate lie ahead including Super Bowl Sunday, graduation season, birthdays, engagements, long weekends, etc. Again, the inner party animal within and your wallet are in discord. Fortunately, you don’t have to break the bank to party. The following money-saving options will help you minimize the expense and stress involved in throwing a party. Start your party planning by writing a list of necessary items, and then take inventory of what you already have. Did you stockpile cookies, alcoholic beverages, or soft drinks during the holiday season? Use them at your party. You can also recycle or repurpose any party supplies or decorations leftover from previous events. Give these items new life by positioning them differently than you did before or coloring them. Are you planning a theme party? Before selecting the theme, look through your closet for clothing that you can easily transform into a costume. For example, perhaps you have ripped jeans and enough hairspray to morph into a poster child of the 1980’s. In that case, opt for a decades or 1980’s theme to save money. Save money by preparing your own appetizers at home instead of buying them prepackaged. Don’t panic – this requires minimal skill in the kitchen. You can slice up a baguette for a simple crostini or bruschetta with your choice of toppings. Bread-based appetizers cost very little, taste great, and are sure to satisfy your guests’ appetites. If you happen to have a home garden, you can also serve vegetables with dip for even more bang with less buck. Alcohol arguably eats up the largest portion of a party budget. However, you can easily whittle down this expense by making your party BYOB. Invite your guests to bring their own booze instead of bringing a gift. With a little more time and patience, you can even brew your own beer. True, this requires an upfront investment in a brewing kit and other supplies, but you will ultimately pay only a half (or even less) of what it costs to purchase most name brand beers. If the thought of drinking beer repulses you, buy an inexpensive wine and whatever fruit is in season for a basic sangria. You don’t need to rent a bounce house or hire a live band to ensure your guests have a good time. You can plan simple activities that encourage everyone to mingle and relax. For example, as each guest enters the party venue, tape or pin an index card with the name of a celebrity to their back. Instruct them to guess the name of their celebrity, without peeking, using clues supplied by other guests. Offer an inexpensive prize to the first person who guesses correctly. This could be your ultimate stress-release party: you won’t have to deal with financial stress and, together with your guests, you will dance off the holiday stress (and weight) and the winter blues. All good things come to an end. The time has come to tackle the post-party mess, but your inner party animal already has plans for the next celebration. Thinking ahead can greatly reduce the amount of time, stress, and expense that comes along with future parties. As you clean, carefully organize any remaining party supplies that can be used later. If party planning has left you drained of energy and funds, be sure to put leftover food in glass storage containers or zip-top freezer bags for convenient and free meals in the days following the party. 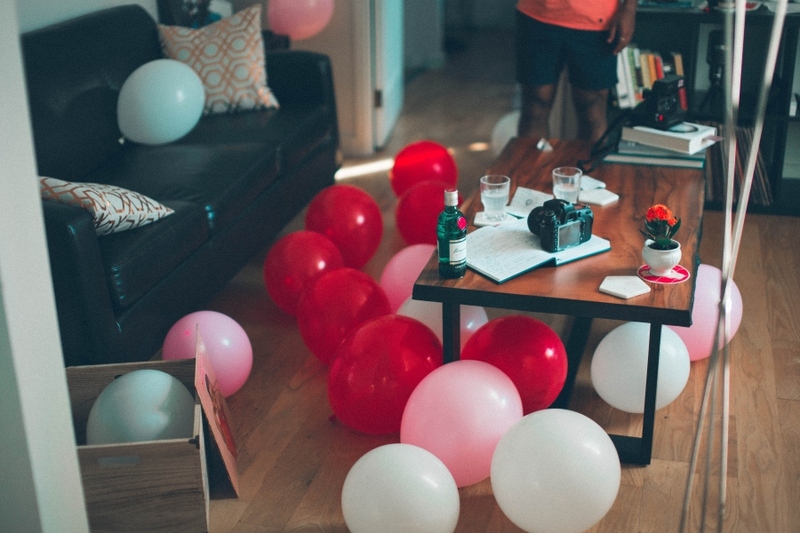 Without question, cleaning up after a party is tedious. Expedite the process by trading your couch for helping hands with party guests too drunk to drive themselves home. You will save yourself time. Your guests will save themselves money that would have been used to take a cab home. It’s a win-win. You don’t need to starve your inner party animal to stick to a budget. You just need a little creativity. Think of fun ways to use what you already have. Get in the kitchen, and whip up some homemade appetizers and beverages. Come up with fun games that will get everyone in a festive mood. Most importantly, have fun in the process.